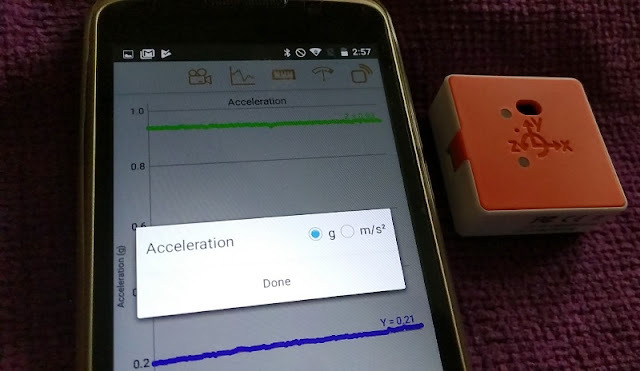 PocketLab Voyager Mobile Processing Lab By Myriad Sensors! Observation and experimentation for the purpose of understanding the world around us is what science is all about! 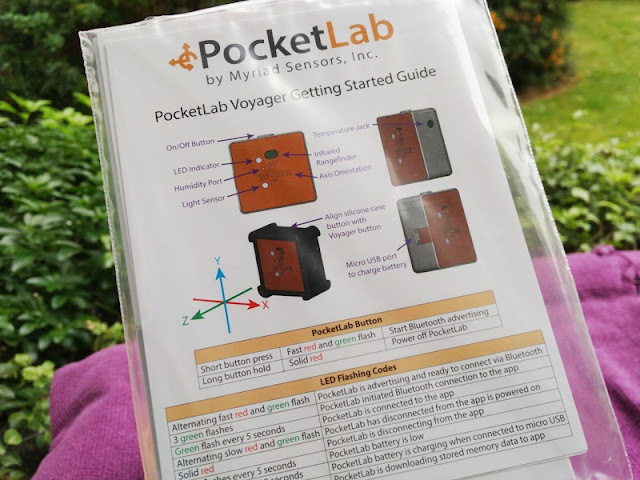 And, what better way to study the physical and natural world than with a mobile lab like the PocketLab Voyager by Myriad Sensors! 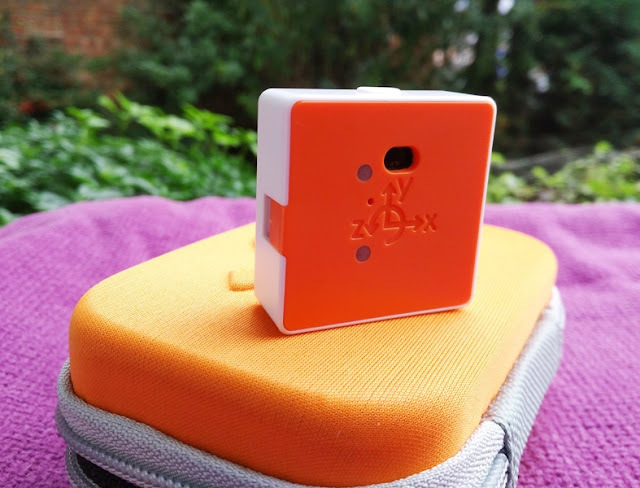 The PocketLab Voyager has an eye-catching orange/white color scheme with three sensors visibly located on the front, which include the infrared rangefinder, light sensor and humidity sensor. 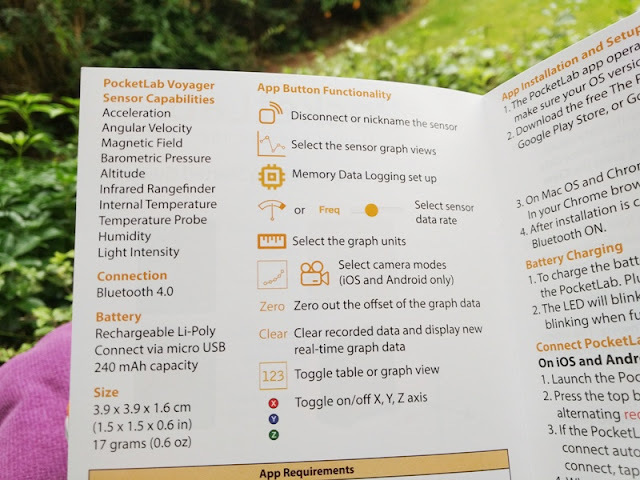 The front of the Voyager has the PocketLab logo embedded with the XYZ axis for sensor orientation on the graph. Y (blue), X (red) and Z (green). Operating the Voyager is easy. Short press the white button and the Voyager powers on automatically broadcasting the Bluetooth pairing signal (LED flashes red and green quickly). To power off the Voyager, you hold down the white button again and let go when the LED shows solid red. What's neat about the PocketLab Voyager is that you can take it on the go with you and fit it in the palm of your hand. 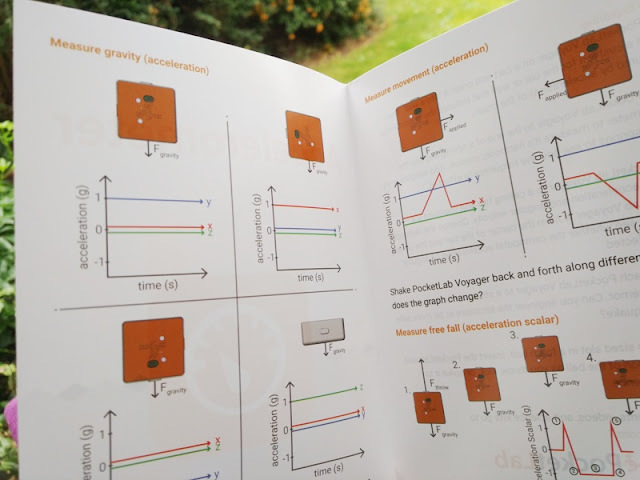 The Voyager is capable of measuring distance, light intensity, acceleration, angular velocity, magnetic field, altitude, temperature, humidity and weight of the atmosphere, in one compact device. 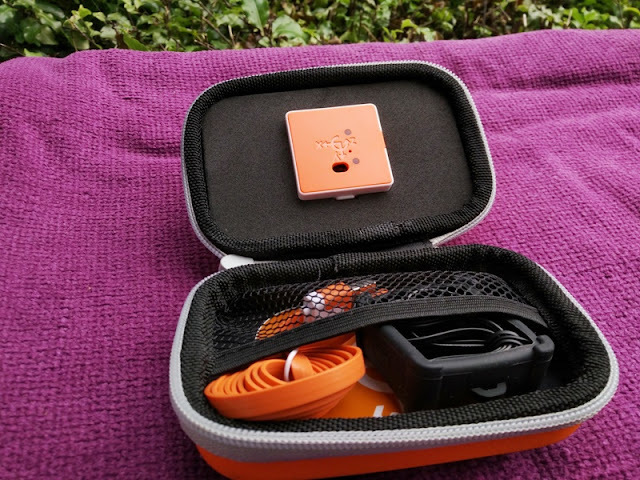 PocketLab Voyager can read up to 30,000 measurements thanks to ten integrated wireless sensors which stream data instantly to a smartphone, tablet or desktop computer via Bluetooth 4.0 connection, which has a range of up to 250 feet. 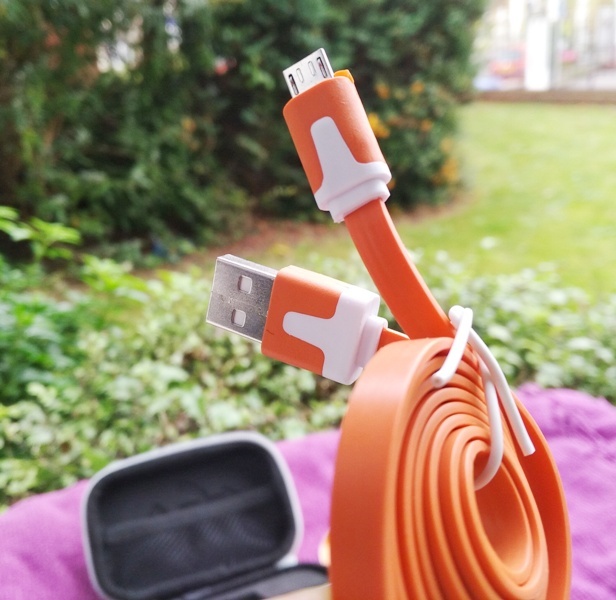 The built-in 240 mAh Li-Poly battery is rechargeable via micro USB cable and lasts between 8 hours (in wireless high power mode) and 12 hours (in low power mode). When the PocketLab Voyager runs low on battery, the LED flashes red three times every five seconds. 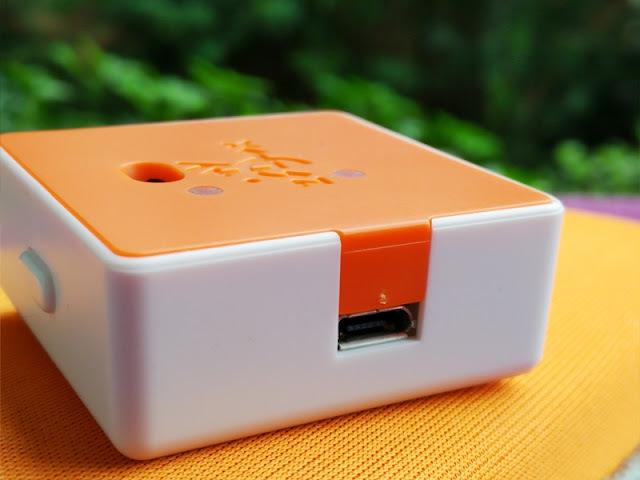 Compared to the original PocketLab, the Voyager can now capture videos and graphs of streaming data, making the Voyager an even more exciting and hands-on way to do genuine scientific research and discoveries. So, to put Voyager to the test we carried out three tests using the camera mode feature of the Voyager to capture the experiment live with streaming data. On the first two test, we measured the acceleration and angular velocity of a USB fan. On the third test, we measured the luminescence of a head torch. 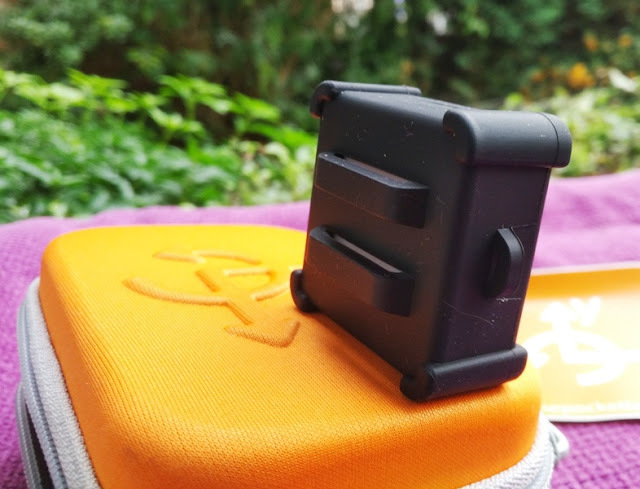 You can carry out all sort of experiments that have never been done before as you can easily mount or attach the PocketLab Voyager to anything thanks to the included silicone case. 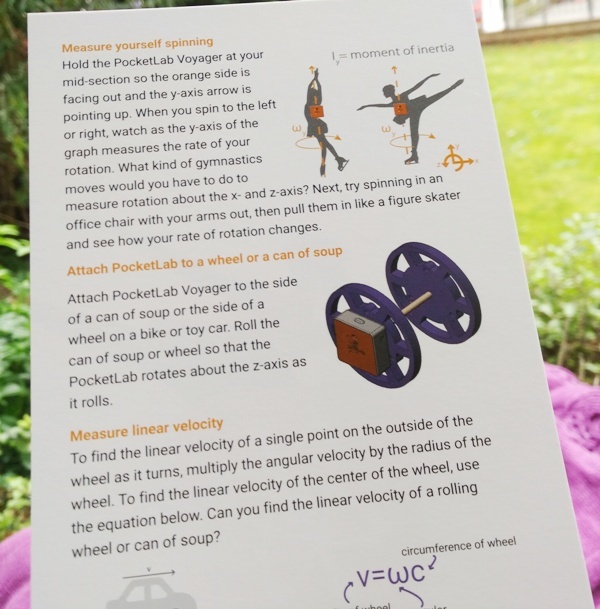 With a STEM-based curriculum, the PocketLab Voyager is a nifty tool to have at hand when studying science, technology, engineering and mathematics (STEM). 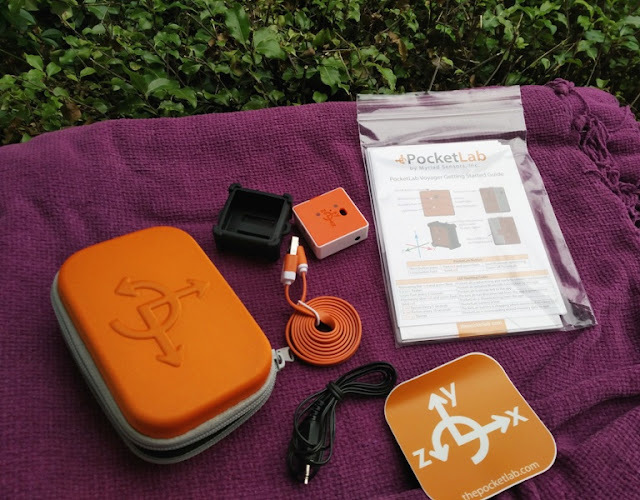 PocketLab Voyager comes in a zippered orange hard case shell with thick internal foam padding to protect the device. 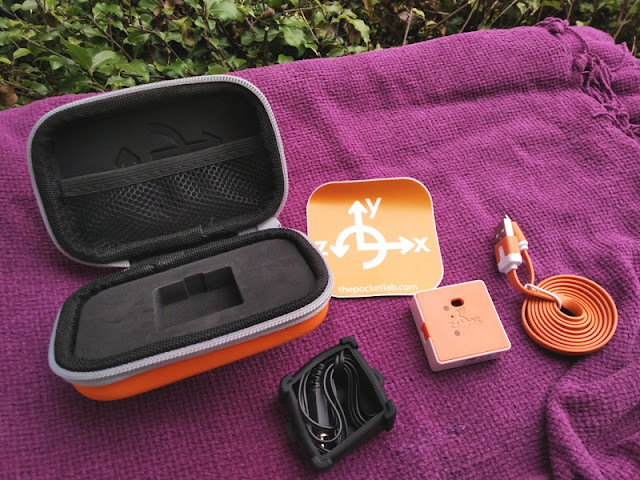 Accessories that come with PocketLab Voyager include a colorful micro USB cable, external temperature probe, protective case and user manuals. While charging the Voyager, the LED will flash red intermittently and then turn flashing green when the battery is fully charged. Full charge takes around 3 hours. 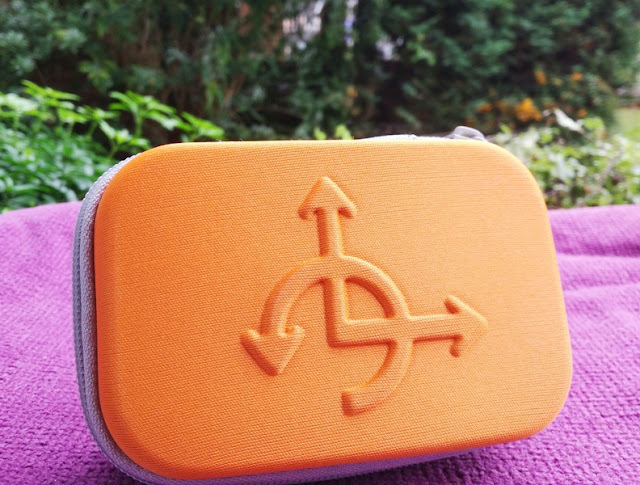 PocketLab Voyager is lightweight, yet durable weighing only 17 grams (0.6 oz) and has the design shape of a square, measuring 3.8 cm (1.5 in) by 3.8 cm (1.5 in) with a thickness of 1.5 cm (0.6 in). The Voyager has a drop protection of 2 meters (6 ft 5 in). 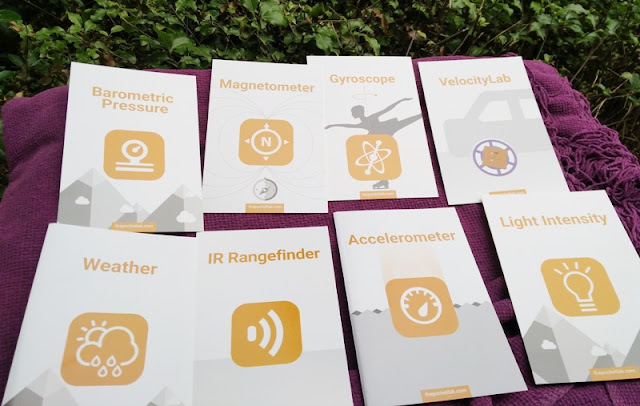 As mentioned earlier, PocketLab Voyager has built-in a total of 10 sensor, including an accelerometer, gyroscope, magnetometer, barometric pressure, light sensor, altitude sensor, temperature sensor and infrared range sensor. PocketLab Voyager also comes with an external probe that plugs into the unit for measuring the internal temperature of things. 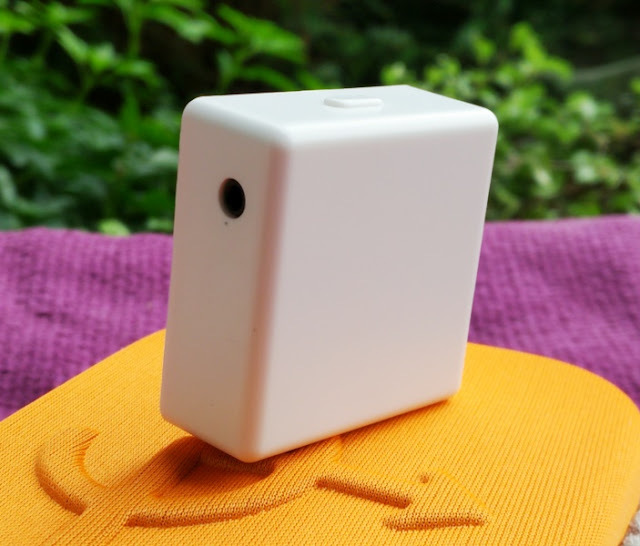 The IR rangefinder sensor is useful for robotic projects where you need to measure obstacle detection or for general use to measure distances. The infrared rangefinder has a basic resolution limit of 1 cm (0.4 in) and is able to measure about 2 meters infront of the range finder with an absolute accuracy true value of 5% of reading at 33 samples per second. The field of view is 25 degrees so the beam has a narrow width that makes it perfect for detecting objects crossing a border. 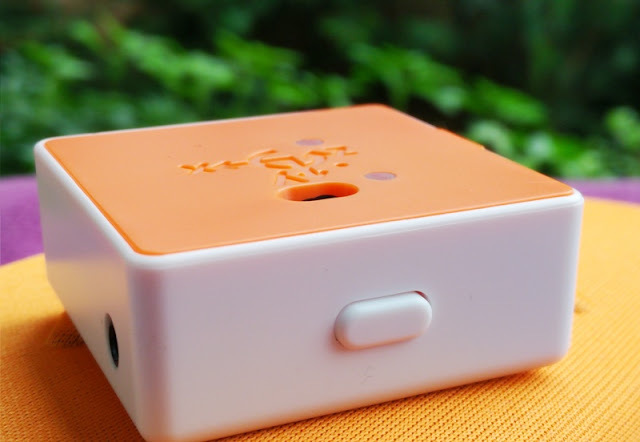 The internal temperature sensor is high precision and has a range from -40 degrees to 85 degrees with a 16-bit resolution, which gives a temperature resolution of 0.01 C (0.02 F) and absolute accuracy of 0.5 C (0.9 F). 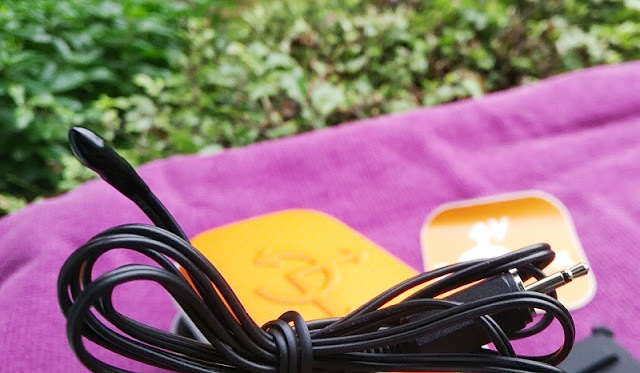 The temperature probe has a range from -40 to 105 C (-40 - 221 F) with a 10-bit resolution, which gives a temperature resolution of 0.2 C (0.4 F)and absolute accuracy of 0.5 C (0.9 F). 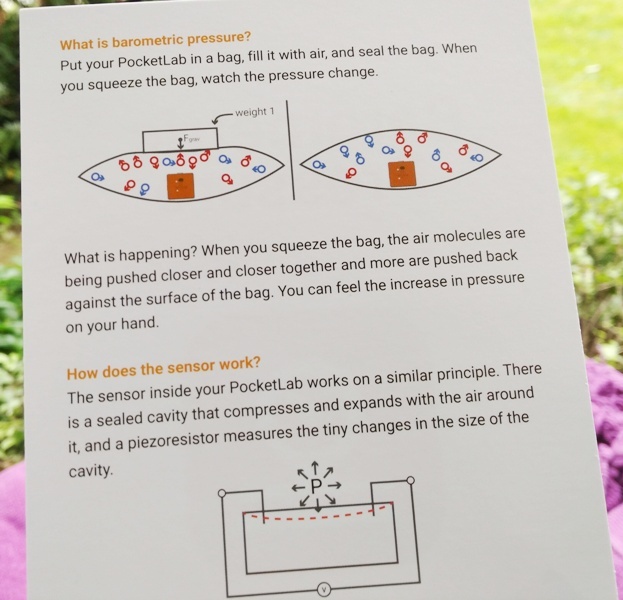 The barometric pressure sensor built-in the PocketLab Voyager has a range from 30 kPa to 180 kPa and can accurately measure altitude accuracy within 11 cm (4 in) and changes in air pressure with high relative measuring accuracy of 0.1 kPa and pressure resolution of 1.3 Pa. The barometric pressure/altitude sensor has a range from -5,300 meters to 9,500 meters (-17,400 - 31,000 ft) and can detect detect altitude changes down to 10 m (33 ft) accuracy at 50 samples per second. 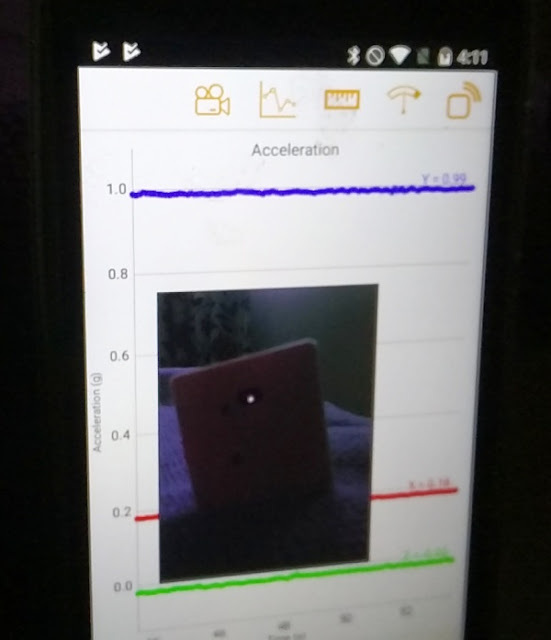 The gyroscope sensor has a really wide rage so it can detect a maximum angular velocity of ± 2000 deg/sec with a resolution of 10 degrees over 100 seconds (0.1 deg/sec) at 92 Hz, which is the inherent sensor noise of the gyroscope. 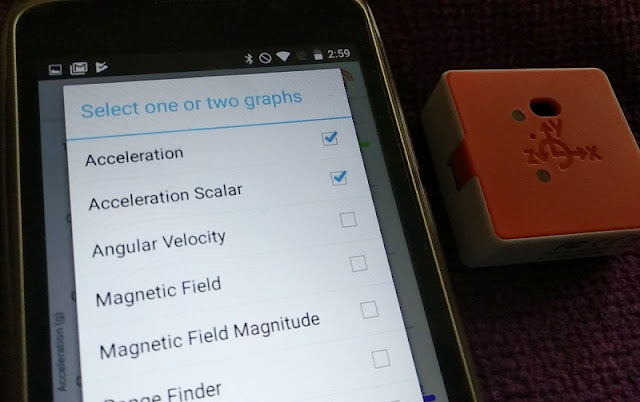 Both the gyroscope and accelerometer can transfer data very fast from 50 samples per second (real time) to 200 samples per second (burst mode). 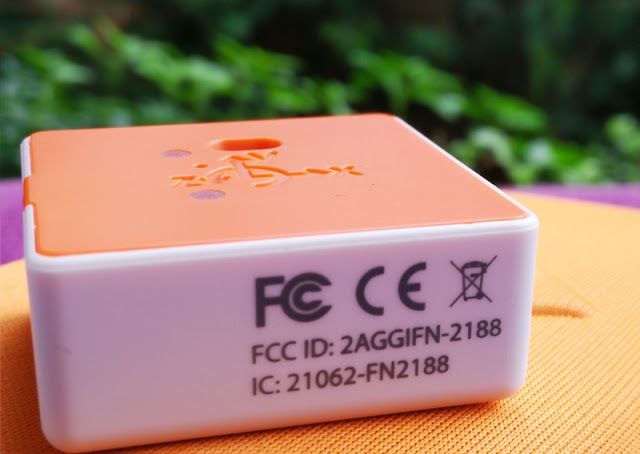 The 3-axis accelerometer is a 10-bit high precision sensor that can measure up to ±16g with 0.008 g resolution at 94 Hz. The magnetometer is useful for measuring the direction, strength of a magnetic field at a particular location and the one built-in the PocketLab Voyager is a high performance sensor with 0.15 uT resolution and broad field range up to ± 4800 uT. 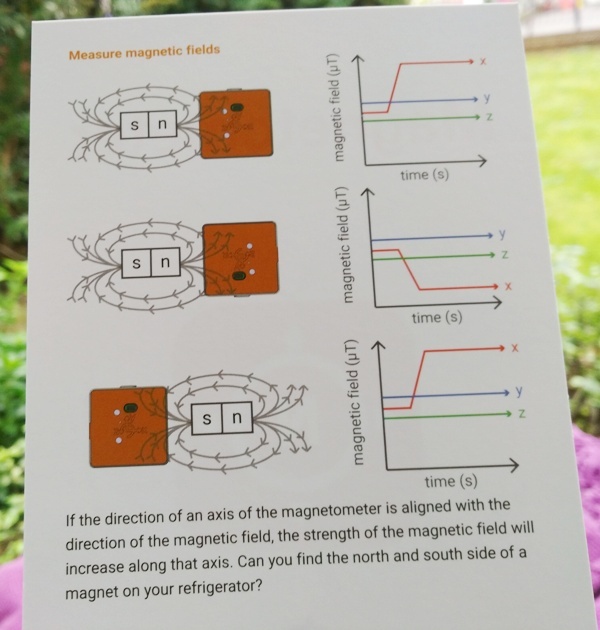 The magnetometer can read 50 samples per second. 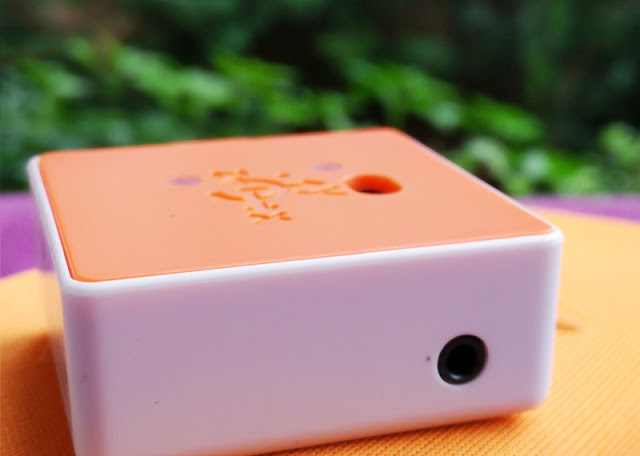 Voyager's humidity sensor measures relative humidity in the air in a range from 0 to 100% RH with a resolution of 0.02 %RH and accuracy of 3% , meaning the humidity sensor is able to sense and report both moisture and air temperature. 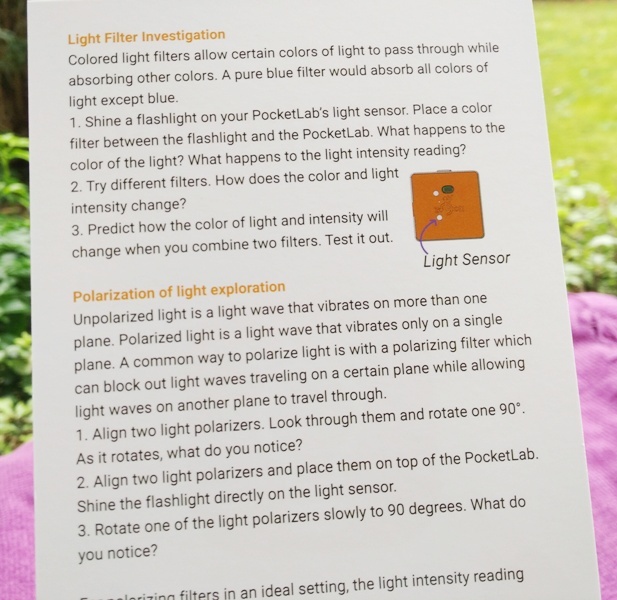 A light sensor is another useful addition to the PocketLab Voyager which allows you to detect the current ambient light (30 samples per second) so you can tell how bright or how dark it is. The light sensor measure light between 400 to 1000 nanometers (nm) and can detect light ranges from 0.01 Lux (pitch black) to 64,000 Lux (direct sunlight). 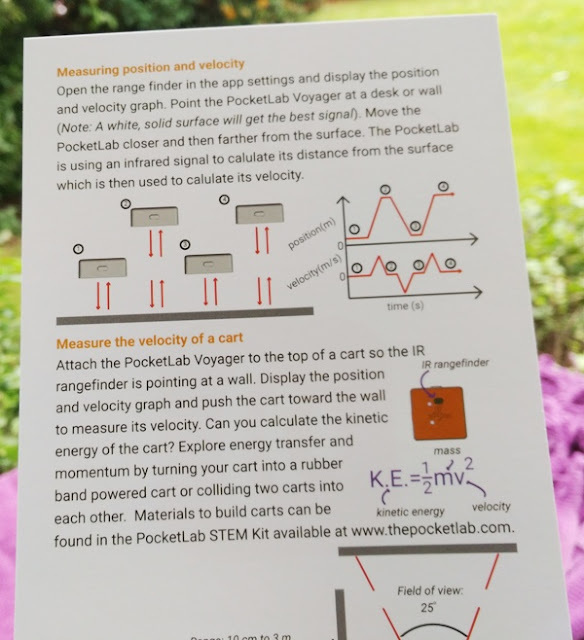 PocketLab Voyager works with the PocketLab web app and a mobile app (available on Android and iOS), called PocketLab app. The mobile app works on Android 5.0 and newer devices, as well as iOS devices, including iPhone (4s and newer), iPad all models (except iPad2 and iPad1), iPod Touch (5th gen and newer). The PocketLab Voyager pretty much works with any wireless device (including Chromebooks) that was built with Bluetooth 4.0, Devices that work 100% with the Voyager include Samsung Galaxy S4, Note 2, Galaxy S7, Nexus 7 Tablet and Archos 50e. As far as computers, the Voyager also works with Mac OSX computers and Windows computers (aside from Windows 10, which is not yet compatible). 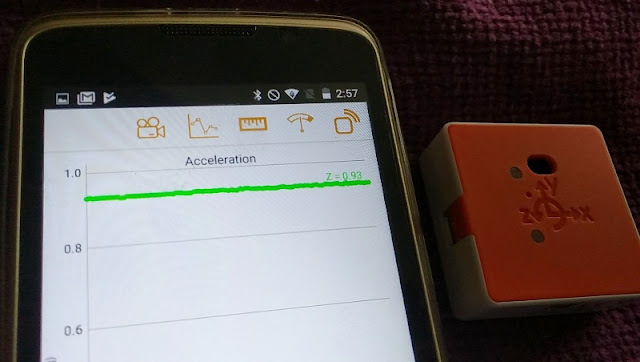 The default main menu in the mobile app consists of five symbols and an acceleration graph. The symbols represent buttons to navigate to different screens. 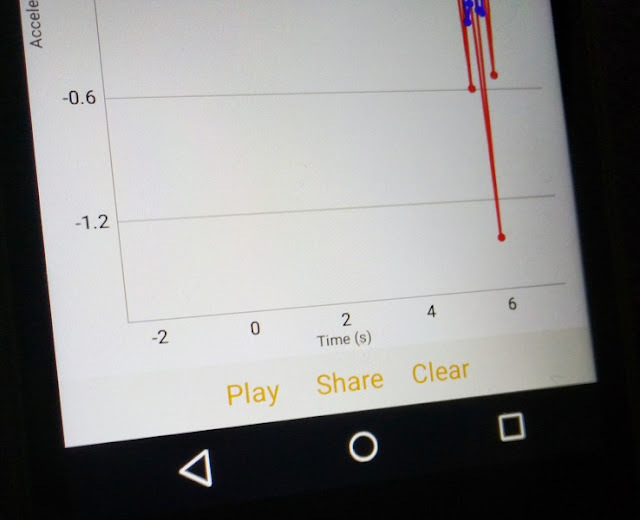 The cam recorder button activates the phone's video camera and generates a small overlay in the screen for recording the experiment and streaming data. This video recording feature is pretty nifty as you can generate a movie recording of sync'd graph data with video footage. 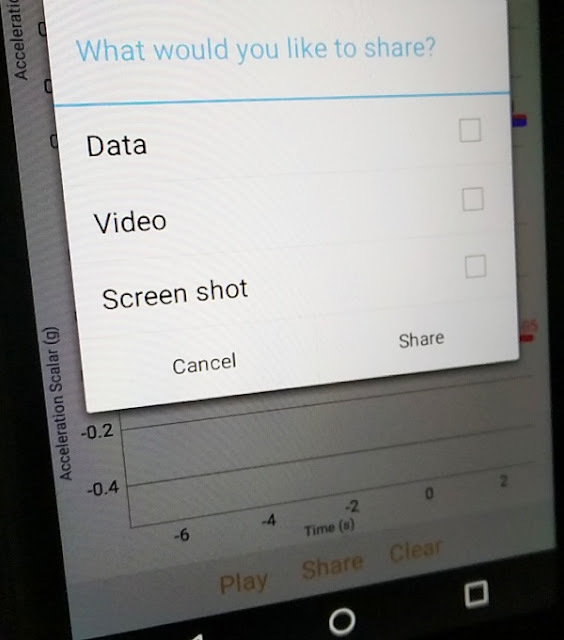 To do this, simply select Share from the menu below and then select Video to generate a video. As well as being able to export the video, you can also export data and a screenshot. 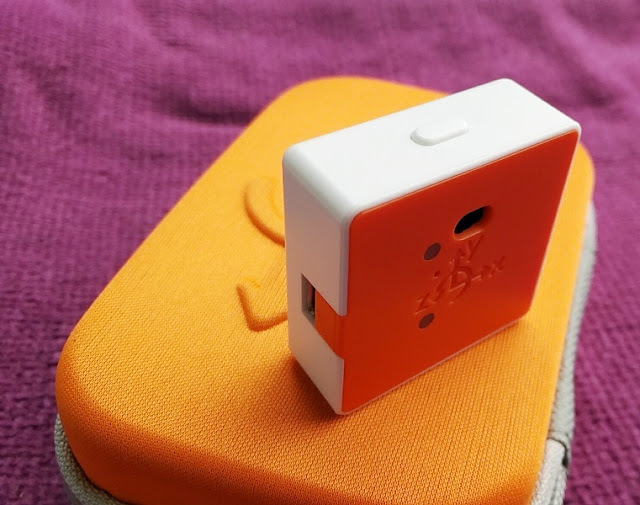 The symbol next to the camera button is the Graph button, which allows you to graph up to 2 sensor readings at the same time. The third symbol from the left is the Acceleration button for changing the acceleration unit from metre per second squared (m/s2) to gravity (g). 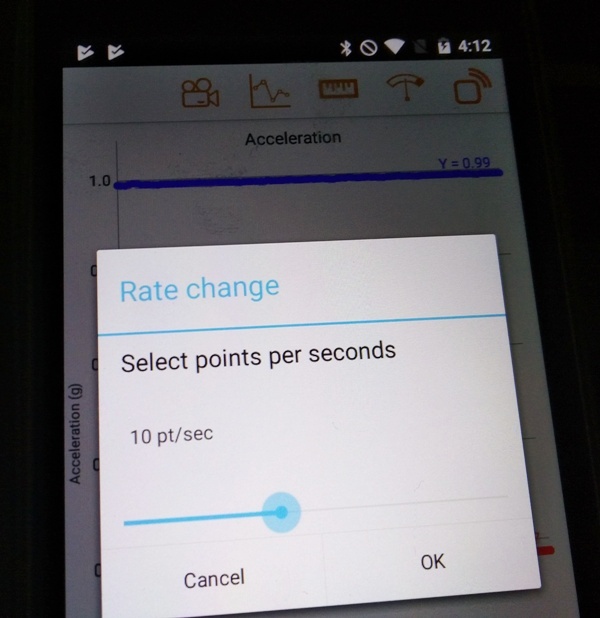 The next symbol is the Rate Change, which is the sampling rate of the sensor data which can be adjusted from 1 point every second, 5 points every second, 10 points every second, 20 points every second, 25 points per second and 50 points per second. 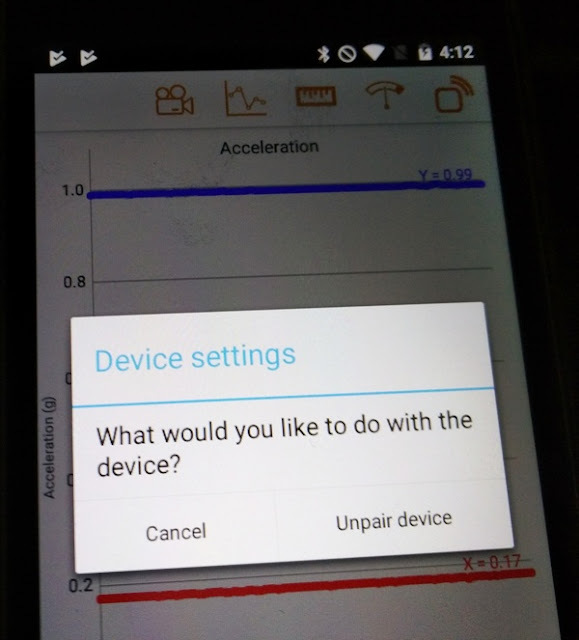 The last symbol is the Device Settings button, which allows you to unpair the Voyager from the current device so you can then pair it to another device. 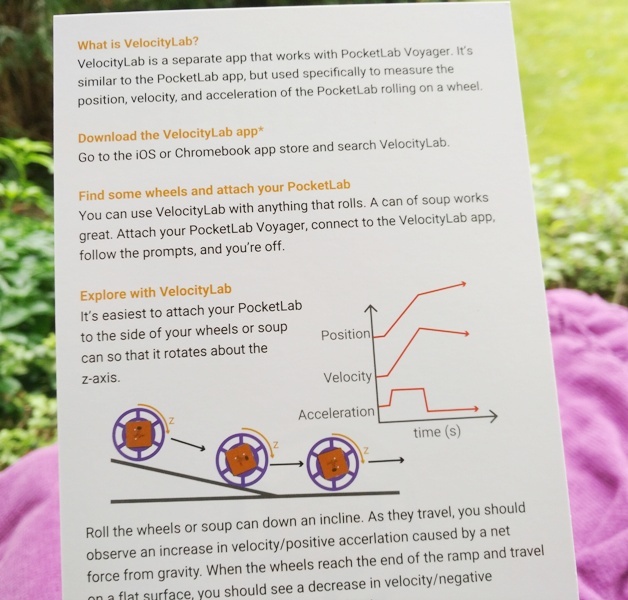 It's also worth mentioning that PocketLab has another app that you can download, called VelocityLab, which is specifically designed to measure the position, velocity and acceleration of a rolling object.